Every year we put together some sort of gingerbread decoration. One year we put together a gingerbread star tree. One year we made a mini gingerbread village. Most years we make a gingerbread house. This year the boys put together a gingerbread train. 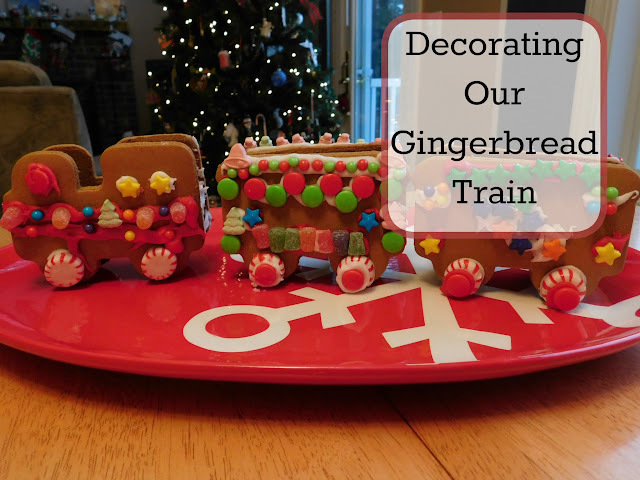 We started with a gingerbread train kit (since no one eats the actual gingerbread here) and purchased a few extra bags of candy in fun holiday colors and shapes. Then I set everything out on the table and let the boys get to work. I never have thought of this as an arts and crafts project because to us it's just a fun holiday tradition. But this year in working on our 100 Days of Art Challenge I'm more aware of all the little ways we use creativity in our lives. Sure it's edible and not what we'd normally think of when someone says "art", but the boys are still working hard to decorate their train "just right!" They planned out where they wanted their candy pieces to go and were so proud of their final results!